Panthers' rider Ulrich Ostergaard won a dramatic last heat in Sheffield. Photo: David Lowndes. If every Peterborough Panthers meeting is as enthralling as their curtain-raiser last night (March 31), it will be an exciting season. The city racers began their 2016 campaign by being involved in the tightest of Premier League Cup tussles at Sheffield in which the two teams were never more than four points apart before a late twist ensured they finished in deadlock. Simon Lambert made a steady contribution for Panthers in Sheffield. Photo: David Lowndes. The early indications to be gleaned from the 45-45 outcome at Owlerton – which earned a couple of valuable Midland Group points - are that Panthers’ will possess the strength-in-depth their bosses desired during the winter and that their luck might be changing. They were riddled with nothing but the bad stuff throughout last season, but benefited from a couple of pieces of good fortune last night. Twice Sheffield riders packed up when leading races (Dimitri Berge in heat eight and Simon Stead in the far more decisive last heat) to gift Panthers a 5-1 and a 4-2 respectively. The visitors went into that finale trailing by two points, but with a consolation point assured providing they had a finisher. 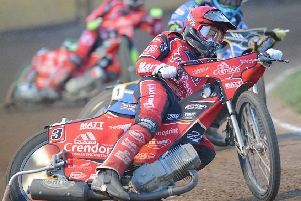 However, they were gift-wrapped an even better outcome when Stead came to a halt on the second lap, leaving Panthers skipper Ulrich Ostergaard to fight off the attentions of Kyle Howarth and pounce for victory with debutant Nikolaj Busk Jakobsen’s third spot hauling them level overall. “It was an encouraging start to the season,” said Panthers team boss Carl Johnson. “We would have been happy to pick up one point at Sheffield in all truth, but that became two in the final race. “It was unfortunate for Simon to break down like that, but Ulrich still had to be there to take advantage and I think a draw was a fair result overall. “We didn’t have any luck all last season so maybe it is a sign that things are changing. “A couple of riders were a little bit short of the points we expect of them, but it was a solid scorecard all the way through. Panthers might only have provided five heat-winners (and three of those successes came from the excellent Ostergaard) but they also only recorded five last places. They were consistent, solid and remarkably sharp considering this was their first competitive outing as a team up against hosts racing their fourth meeting of the season. No-one contributed fewer than four points to the cause, including new British reserve Tom Perry whose paid five from three rides was a welcome contribution. Panthers did look rusty when Ostergaard and Simon Lambert both missed the start by a mile in heat one and watched on from a distance as Stead and Berge bagged a simple 5-1, but the city duo made amends in their next appearance in heat five when roaring to a full house of their own to level. They were soon back behind again after new recruit Nicklas Porsing, who suffered some mechanical issues during the night, was pipped by Stead in a thrilling heat six scrap that ended in a 4-2 to Sheffield. But Berge’s breakdown in heat eight presented Emil Grondal and Lambert with a 5-1 which allowed Panthers to hit the front for the first time just past the halfway point. A home maximum from Josh Bates and Howarth soon changed that as Porsing retired from last place and another 5-1 to the hosts looked to be on the cards in heat 10 until Michael Palm Toft minimised the damage with a terrific swoop down the inside of Owlerton master Stead for second place leaving the final bend. Ostergaard ended the winning run of Sheffield guest Ricky Wells as Panthers halved their deficit to two points with a 4-2 in heat 11 and that’s the way it stayed until the skipper seized control of the finale after Stead was struck by bike gremlins. Panthers are back in action tonight (April 1) when hosting Scunthorpe in their first home meeting of the season at the East of England Showground (7.30pm). SHEFFIELD: Simon Stead 10, Kyle Howarth 9+2, Ricky Wells (guest) 8, Josh Bates 8, Dimitri Berge 6+1, Richard Hall 4, Nathan Greaves 0. PANTHERS: Ulrich Ostergaard 11, Emil Grondal 8+1, Nikolaj Busk Jakobsen 8, Simon Lambert 6+2, Nicklas Porsing 4+2, Michael Palm Toft 4+2, Tom Perry 4+1.